Amano Time Guardian MTX-30 Proximity - Starting at $365.00! - ID Badges Unlimited Inc. Complete time tracking system using proximity badges. 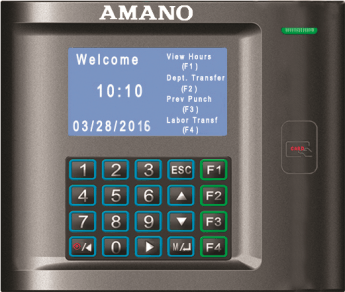 This economical time clock system interfaces with most common payroll applications, providing a complete turn-key solution to accurately and efficiently manage your payroll. It enables you to automate the collection, calculation, and preparation of employee time data, while increasing your profits. Dimensions: 22.50 Height x 8.25 Width x 1.50 pocket Depth. PLEASE NOTE: TimeClockSupplies.com does not offer direct technical support. To save you money, all products are sold as self-install systems. If you feel you need extra technical help, we highly recommend you purchase an Amano support agreement. All Amano support technicians are factory-trained experts.